TOWSON – Despite being on a stage with the likes of David Simon, Rod Daniels and Baltimore Mayor Stephanie Rawlings-Blake, it was a group of talented 6th-graders who undoubtedly stole the show. Sisters Academy of Baltimore held a major fundraising event at Goucher College’s Kraushaar Auditorium Oct. 16. “Are You Smarter Than a 6th Grader?” pitted the southwest Baltimore school’s 6th-graders’ knowledge of math, literature, world geography, and other subjects against that of local celebrities. Joining Simon, creator/writer of HBO’s “The Wire,” Daniels, lead anchor of WBAL-TV, and Rawlings-Blake were Marc Steiner, WEAA talk-show host, Enoch Pratt Library CEO Carla Hayden, and Debbie Phelps, the mother of Olympic superstar Michael Phelps. School Sister of Notre Dame Delia Dowling, president and co-founder of Sisters Academy, was elated that the six-year-old institution received support from hundreds, who paid $25, $75 for a VIP ticket. Sisters Academy of Baltimore is a middle school for girls who from families of limited economic means in the inner city. Founded by and sponsored by four religious congregations (the School Sisters of Notre Dame, the Sisters of Bon Secours, the Sisters of Mercy and the Sisters of Notre Dame de Namur), the school is tuition free and serves grades students in grades 5-8. “We seek girls who are motivated, those who want to learn and want to further their education,” Sister Delia said. The school’s goal is one that connected with Daniels. Though the school is small – each grade has about 20 students – that did not lessen the issues it has faced. Some of those older students helped with the event, showing up as early as 9:00 a.m. to set up. 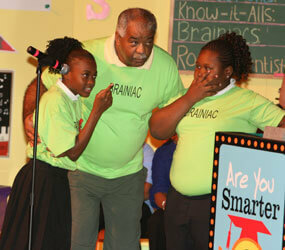 Octavia Mclean, on the “Know It Alls” team with the mayor, was nervous beforehand. School Sister of Notre Dame Debbie Liesen, principal of Sisters Academy, said that the school is unsure how funds raised will be used. Her main focus Oct. 16 was her students displaying what they have learned, and her belief that they will only show improvement, as others who have passed through the young school’s doors.